With Post-Graduate degrees in both Coronary Care and Emergency Nursing, Emma Shears was the right person to accept the Nurse Unit Manager position at the new Friendlies Emergency Department. Opening on Tuesday, September 25, Emma has been instrumental in setting up the new Unit from the ground up, enabling The Friendlies to create a department that is focused around patient experience and professional outcomes. “It is rewarding being involved in setting up the new unit,” Emma said. “I’ve been involved in creating policies and procedures, organising stock imprest lists, ordering equipment and a multitude of other things to ensure the unit runs well. “I’m so excited to have been given this opportunity to lead this new department, it’s my dream job. Emma said the unit would be staffed with a team of experienced nurses dedicated to making it a nice experience for everyone who presents to The Friendlies Emergency Department. 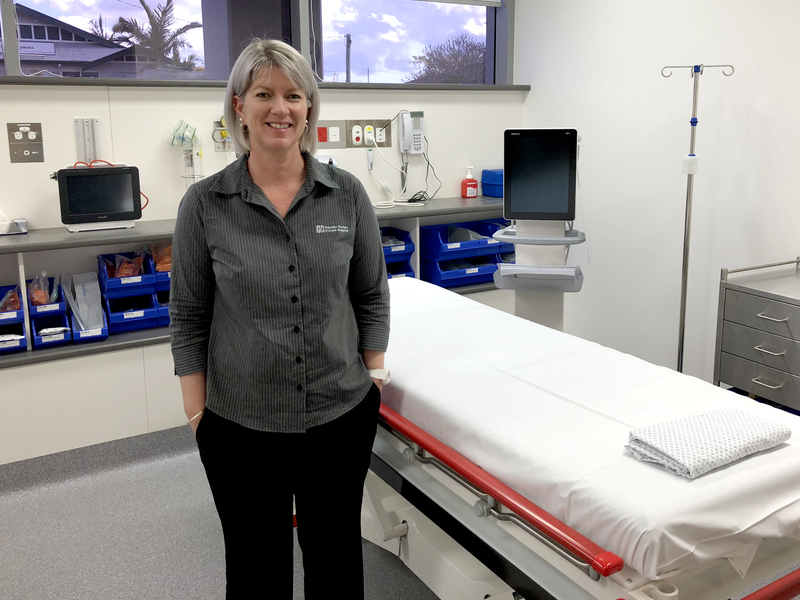 “I’m glad we can offer this friendly, professional service to the people in our region for their health care needs and to try to ease the burden on the current services in Bundaberg,” she said. The daughter of a farmer and a nurse, Emma didn’t gravitate to a nursing career straight away. “After I left school, I completed five years in an administrative role, but I had a desire to work with people to make their lives better,” Emma said. With her mum being a nurse, Emma said she had experienced first-hand the difference a nurse could make to a person’s life, further drawing her to the profession. “Even before I started in nursing, I had personally experienced how a caring nurse can make all the difference to a patient and their loved ones. I think as the family of a patient, you caring nurse helps you feel assured your loved one is in good hands and being cared for, even when you are not there,” she said. Emma began her career at The Friendlies, joining the Graduate Program. After four years of nursing and having two children, she felt the call to emergency nursing. “I completed my second-year university placement in Emergency at the Base Hospital and just knew that Emergency Nursing was my passion,” she said. Emma continued doing one shift a week in The Friendlies Critical Care Unit, while working as an Emergency Nurse at Bundaberg Base Hospital. She undertook further study and obtained tertiary qualifications in Coronary Care and Emergency Nursing and recently completed her Trauma Nursing Core Course (TNCC). She is able to work in any part of the Emergency Department, from trauma to resuscitation to triage. She loves all aspects of nursing in emergency. When Emma isn’t at work, she is enjoying time with her family and her small slice of Bundaberg. “I love to call Bundaberg home. I moved here with my family when I was 12, completed high school and later married a Bundy boy, and I am glad we can raise our children in a region that has so much to offer” she said. “I am such a farm girl, I love living on the land, which is why we bought acreage in the middle of cane fields, it’s our little slice of heaven”. Emma said they use the land to grow Rhodes Grass for cattle/horse feed, which they are currently preparing to donate to the drought relief effort through the support of others in the community.